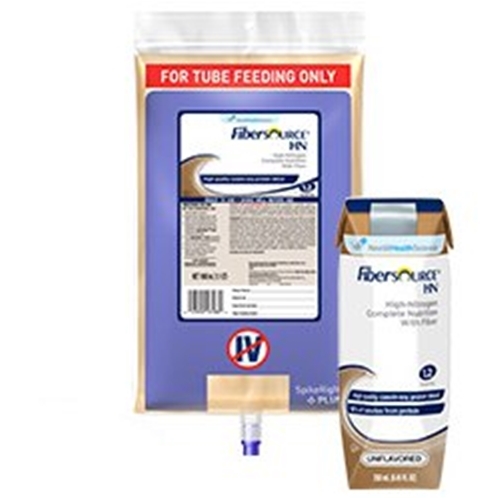 Fibersource HN Tube Feeding Nutrition from HealthyKin.com is high-protein, standard nutritional support with fiber. It contains 1.2 calories per mL and 62 g of protein in a complete feeding. Protected by NutriShield - a proprietary combination of microbial inhibitors protecting from harmful bacteria, especially in open system. Great service ,fast deluvery, will order again. Great service, great price, and deliverd right at my door will continue to order from yall! Great service. Food works great through g tube and is a good value, delivered right to door. Product delivered on time. An alternative to higher caloric Isosource. Great pricing. Quick delivery. I would recommend to others. Healthykin is a true lifesaver- they always get the product which I am heavily dependent upon to me super fast without any trouble or hassles. Thanks Healthykin! Delivered right away, everything in order was correct-- I got it just when I really needed my shipment. Thanks! So glad I found HealthyKin. My products are delivered quickly right to our door. Much cheaper than going to a local pharmacy and carrying those heavy boxes home. Also, when a rare problem occurs (usually UPS problem) you always make it right! Thanks for your great service.